vst. (1dc, ch1, 1dc) in same space or stitch. Row 3 - ch3, 1vst in ch1 space of each vst to end, 1dc in top of ch3. Turn. Row 4 - Rpt Row 3. Fasten off. Turn. Row 6 to 10 - Join in color 3, ch1, 1hdc in base of ch1, 1hdc in each hdc to end. Turn. Fasten off at the end of Row 10. Turn. Row 11 - Join in color 1, ch1, 1hdc in base of ch1, 1hdc in each hdc to end. Fasten off. Turn. Rpt Rows 2 to 11 five more times. Fasten off. Turn. Rpt Rows 2 to 5 once. Fasten off. Border - Using to 5.50mm hook and color 3, ch1, 1hdc in base of ch1, 1hdc in each hdc to end, 3hdc in last hdc, work 86hdc evenly in row ends down first side of blanket to corner, 3hdc in corner, 1hdc in each ch along cast on edge to corner, 3hdc in corner, 86hdc evenly in row ends up second side of blanket to corner, 1hdc in corner, sl st to first hdc. Turn. Work 2 more rows of 1hdc in each hdc, work 3hdc in corners and sl st to first hdc at the end of each row. Fasten off. Turn. Join in color 1 and work 1 row of hdc, working 3hdc in corners, sl st to first hdc on beginning of row. Fasten off. Turn. Join in color 3 and work 2 more rows of 1hdc in each hdc, work 3hdc in corners and sl st to first hdc on the end of each row. Fasten off. Finishing - Weave all loose ends of yarn and trim. 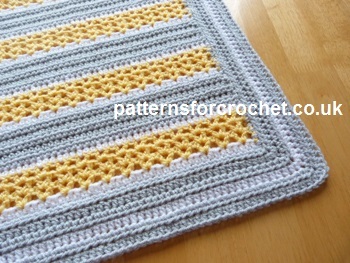 Hope you enjoy this free baby crochet pattern for a stroller blanket.